One of Mayor Duggan’s biggest initiatives came with a large amount of federal and private funding. Duggan essentially kicked out the Pulte Family’s “Detroit Blight Authority” efforts, so they have started spending their money focusing their efforts on tearing down blight in Pontiac. The Motor City Mapping project and the subsequent “Blight Report” from the Blight Removal Task Force chaired by Dan Gilbert further emphasized the removal of blighted structures. 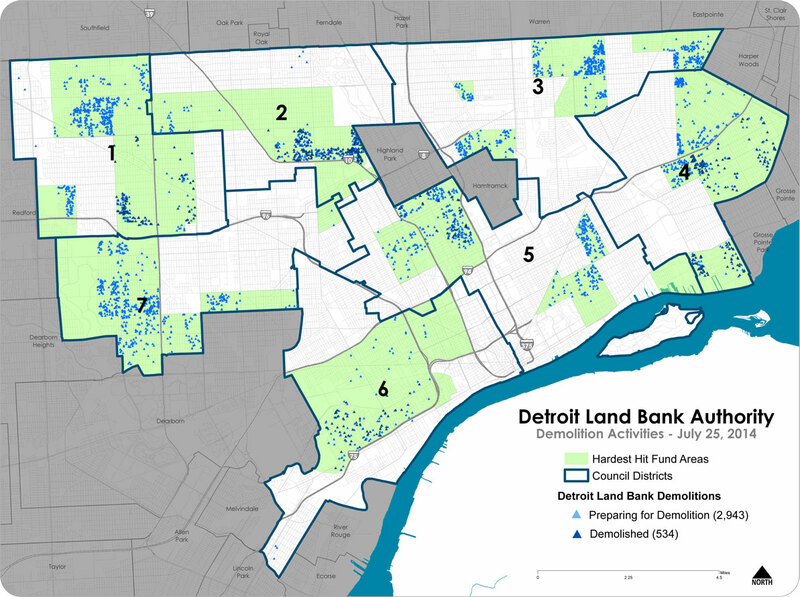 There are a number of financial interests in bringing down blight, from the city government image department, to funders of the Detroit Future City Plan (Kresge, Skillman, etc.). Each week the Mayor highlights how many houses were demolished as part of blight elimination. In the last 2 weeks I’ve heard various reports from friends who are residents of dozens of homes getting torn down in the matter of hours: in the Osborn area someone talked about starting at 7am, eight houses in a row were torn down and in the North End nearly 12 were taken down between 9am and noon. The data used in the above map is unfortunately only available in PDF format. UPDATE 09/22/14: I spent a few hours today scrapping the data. Enjoy!